(The Gleaner): Accusing the People's National Party of carrying out a campaign to derail Chinese investments amounting to more than US$1 billion in Jamaica, the Bruce Golding-led administration says thousands of jobs are now under threat as a result of "spurious aspersions" by the Opposition. In a swift response yesterday, Opposition Spokesman on Transport and Works Dr Omar Davies dismissed the Government's assertion as propaganda. 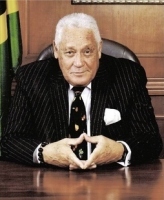 Transport and Works Minister Mike Henry charged yesterday that "concerted efforts" led by the PNP to discredit the Jamaica Development Infrastructure Programme and China Harbour Engineering Company were threatening a number of major Chinese investments earmarked for Jamaica. Rubbishing the claim, Davies said: "The PNP has never in its history, nor does it now, take positions that will affect genuine foreign investment." However, the PNP spokesman contended: "We will not let this sort of propaganda deter us from carrying out our task which is to ensure that, whatever money is being spent by the Government, the country receives value in return."